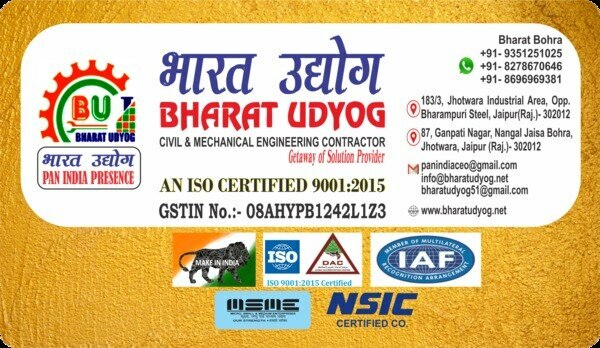 Bharat Udyog We, Bharat Udyog from 2012 are one of the well known Manufacturer and Wholesaler a broad exhibit of Industrial Shed. Our offered range comprises of best grade Industrial Shed, Sign Boards and Hoardings and significantly more. We likewise give Fabrication Work, Pipe Line Services and considerably more. These items are fabricated with the utilization of best quality materials, and systems. Our items are acknowledged for their highlights like split and erosion obstruction, simple to utilize, low support, long administration life, and lightweight. Moreover, we are additionally offering Fabrication Work Service to our esteemed customers. We have made a profoundly advanced foundation base. This foundation incorporates producing, research& control, deals and a lot more offices. We utilize most recent machines and procedures in our creation, quality affirmation, and bundling. Aside from this, our R and D unit works dedicatedly to investigate most recent innovations and expelling inadequacies of the items. Attributable to our moral business arrangements, straightforward dealings, and customer driven methodology, we have a not insignificant rundown of our fulfilled customers. Together with this, our exchanging brands are Tata, Jindal, SR, and Swastik. Our coach, Mr. Bharat Kumar Bohra, has guided us to have the capacity to achieve such statures. His tremendous industry encounter has helped us to position ourselves in an unparalleled position in the business.